Sometimes it can be easy to imagine how many of the wonders of French cuisine came into being. Take cheese, for example. As we just learned in Level 2, cheese is made by the coagulation of milk, either by mixing it with rennet (which comes from the stomachs of cows, sheep, and goats) or with an acid like vinegar. Early shepherds used to carry water or milk in the stomachs of these animals. A plausible explanation for how cheese came to be is pretty straightforward: A shepherd was using a new goat stomach, say, and there was still some rennet inside. Add a little goat milk, a day of jostling around the meadow, and voilà! Milk curds and the first venture down the cheesy road of deliciousness. But there are other things where you really have to wonder. As I embark on Level 3, one of the first week’s tasks is to prepare—every day—a chicken consommé. Having done a consommé just once, and it was weeks ago in Level 1, I wanted to practice. When I made consommé at home, I had to stop and wonder how the heck they figured out that ground meat, egg whites, vegetables, and stock can combine to become such an ethereal thing as consommé. Apparently, consommé has been around since the Middle Ages, and many French chefs and food experts believe it to be one of the defining skills that differentiate mere cook from accomplished chef. A consommé is somewhat akin to wine making, where the solids are bound to proteins and removed to create a clear end product. After all, most of us prefer our wine clear vs. cloudy. With the soup, we use a mirepoix of julienned carrots, celery, leeks, and tomatoes to bind together with ground meat and egg whites, which then attract any solids in the stock. The mystery of its origins is further enhanced by the technique, not just the ingredients. First, the vegetables are cut into a julienne, thin matchsticks that supposedly enable the "raft" to form more readily. Tomatoes are critical because of the acid they introduce into the mixture. Combining the vegetables, meat, and egg whites with the stock, the chef brings the whole zoo gently up into a boil, all the while stirring the bottom of the pot to prevent the whites from coagulating and burning on the bottom. 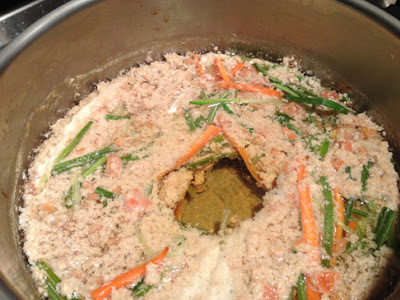 Once the meat and vegetables have formed the raft and the stock has boiled, stirring ceases, the heat is lowered to a gentle simmer, and the chef forms a hole in the raft. This enables him or her to ladle out stock onto the raft as it cooks, keeping it moist and imparting its flavors into the brewing consommé below. 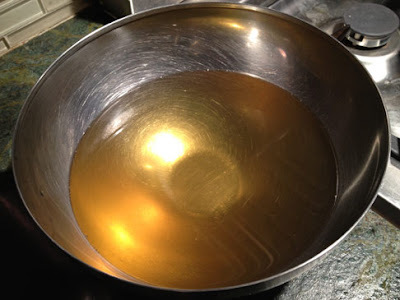 After about 30-45 minutes, once the flavor has developed, the consommé rests briefly and then is ladled gently through a cheesecloth-lined chinois, any fat is skimmed off with paper towels, and the bouillon is seasoned with salt. The result is the clear, bright nectar of the stock—amber if made from a traditional veal stock with a blackened onion (called a marmite), golden yellow if made from chicken stock. Many of today’s emerging culinary stars may be turning to molecular gastronomy biology to create new flavor extractions and textures. As for me, I’ll take this amazing feat of kitchen science created hundreds of years ago by someone who hadn’t figured out indoor plumbing, but who knew a good thing when they tasted it. Laura Grimmer is a current student in the Classic Culinary Arts program. Her blog is called The Perfect Pair, and she writes about her mutual loves of food and wine.